Evidence of man’s use of animal milk as food was discovered in a temple in the Euphrates Valley near Babylon, dating back to 3,000 BC. Humans drink the milk produced from a variety of domesticated mammals, including cows, goats, sheep, camels, reindeer, buffaloes, and llama. Today, the largest milk and dairy producers in the world are India, the U.S., Germany, and Pakistan. There has been a steadily increasing demand for milk as developing countries become more affluent. 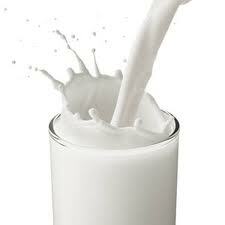 Milk directly from a cow in its natural form is called raw milk. Raw milk is processed by spinning it in a centrifuge, homogenizing it to create a consistent texture (i.e., by forcing hot milk under high pressure through small nozzles), and then sterilizing it through pasteurization (i.e., heating to a high temperature for a specified length of time to destroy pathogenic bacteria). Condensed, powdered, and evaporated milk are produced by evaporating some or all of the water content. Whole milk contains 3.5% milk fat. Lower-fat milks include 2% low-fat milk, 1% low- fat milk, and skim milk, which has only 1/2 gram of milk fat per serving. The Chicago Mercantile Exchange has three different milk futures contracts: Class III which is milk used in the manufacturing of cheese, Class IV which is milk used in the production of butter and all dried milk products, and Nonfat Dry Milk which is used in commercial or consumer cooking or to reconstitute nonfat milk by the consumer. The Class III contract has the largest volume and open interest. Class III Milk futures provide a way to effectively manage the price risk that merchandisers, producers, processors, and others have related to the purchase or sale of Class III Milk. Futures provide a vehicle to evaluate the current and future supply and demand situation for Class III Milk and related dairy products. Futures traders are able to take advantage of arbitrage and spread opportunities with other dairy products. The futures contract trades on Globex, the CME Group’s electronic exchange. The market opens at 5:00 PM CT and closes at 4:00 PM CT, Sunday through Friday. The one exception is Friday when the market closes for the day at 1:55 PM CT.
One Milk futures contract is 200,000 pounds, or approximately 90 metric tons. The futures contract pricing is cents per hundredweight (cwt). The previous settlement price (November 7, 2012) for December 2012 Milk futures was 19.82, or $39,640 per contract. The most common contract symbol is DA. One futures contract price increment or “tick” is $0.01 per cwt. A one “tick” move is $20.00. The next tick after 19.82 downward is 19.81 followed by 19.80. Therefore, a price move from 19.82 to 18.82 is $2,000. The performance bond or initial margin requirement to initiate one futures contract is $880 (as of November 11, 2015). To control that futures contract going forward the maintenance margin becomes $800 (as of November 11, 2015). The Daily Price limit is $.75 per cwt above or below the previous day’s settlement price. The futures contract month listings are January (F), February (G), March (H), April (J), May (K), June (M), July (N), August (Q), September (U), October (V), November (X), and December (Z). The futures contract’s Last Trading Day (LTD) is the business day immediately preceding the day on which the USDA announces the Class III price of that contract month. The December 2012 Milk futures contract LTD is January 3, 2013 for example. This particular market is light on trading volume and open interest in comparison to other physical commodity markets. Expect potential slippage. Visit https://www.danielstrading.com/ for additional contract specifications and market information regarding the Soybean Meal futures market.